We live in Greeley, CO, in one of the most unique states in the Union. Colorado’s mountain atmosphere and natural beauty make it a destination place for tourists, campers and anyone who loves the outdoors. But our high elevation and cold winters provide a number of challenges to homeowners and businesses hoping to keep their spaces comfortable. That extends to heating, air conditioning and indoor air quality, as well as all the products and services designed to help them function. When you need the help of an expert, it pays to look to companies with local roots, like the pros at McCreery & Sun Of Colorado. We’ve been serving our neighbors in the Greeley, CO community for many years, and we pride ourselves on offering a wide array of solutions for your heating, air conditioning and indoor air quality systems. Whether you need something new installed, an existing system repaired or maintained, or an outdated system replaced, you know just who to contact. Together, we can make your home the place you always wanted it to be. Give us a call and let us show you how! They are very qualified and know their business. Our winters in Greeley are cold and snowy, and a heating system is more than just a luxury. It is an absolute necessity not only for your household comfort levels, but for the safety and health of your family. 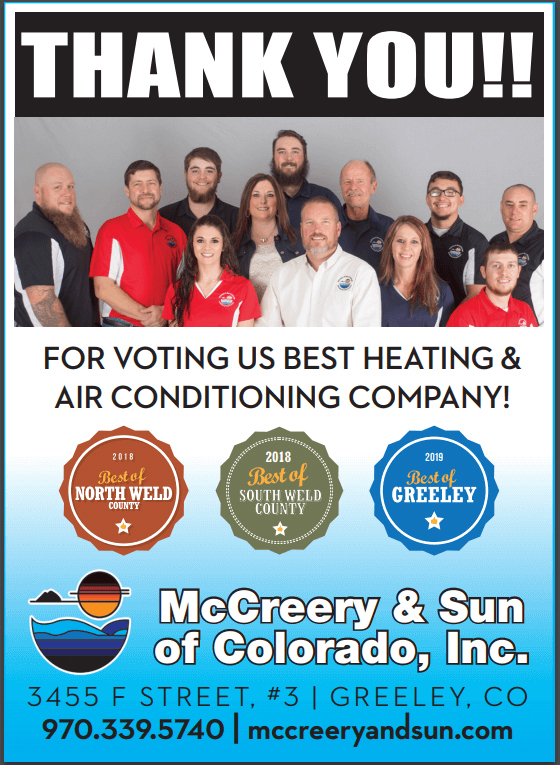 We take such duties very seriously here at McCreery & Sun Of Colorado, which is why we offer complete heating services on a wide array of products. That includes traditional boilers and furnaces as well as more modern technological developments like solar powered heaters. Whether you need a new system installed, an old one replaced, or an existing one give a tune–up, or repair, you need not look anywhere else. Pick up the phone and give us a call today! Air conditioning isn’t quite as important as heating systems up here in the mountains, but we still get plenty of hot days in the summer, and an air conditioner can be your best friend when the temperatures start to rise. In Greeley, we can provide you with the very best air conditioning service to keep your home feeling cool. That includes installation, repair, maintenance and replacement services, not only on traditional forced–air centralized systems, but on alternative systems such as heat pumps and ductless mini–split systems. No matter what problems you may have, the experts at McCreery & Sun Of Colorado have the tools and the know–how to do the job right. Give us a call today and let us show you what we can do! At McCreery & Sun Of Colorado, we know that you trust us with more than just fixing a faulty air conditioner or heater. You trust us with your family’s comfort and that’s a duty we take very seriously. Our technicians are all NATE–certified — providing the highest level of skill — and prompt, efficient work is guaranteed. We have 24–hour emergency services to take care of those problems that can’t wait, and our staff conducts all our operations with professionalism and care. If you have a problem with your HVAC system, don’t hesitate to call on us. You’ll see what a difference we can make!